Solid stoppers are sometimes useful for the home brewer or winemaker. They can be used to temporarily or permenantly seal a carboy or secondary fermenter keeping unwanted air and bacteria out. 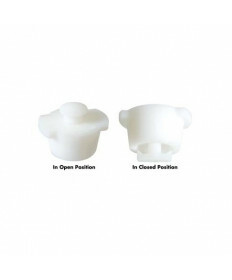 Having the correct size stopper ensures a good seal and prevents the possibility of contamination. WARNING: Be sure all fermentation is finished before using a solid bung on a carboy. If fermentation is not complete and gas pressure builds, the stopper could be dislodged from the carboy with great force or the carboy could explode. For 3, 5 and 6 gallon Plastic Carboys we recommend #10 Solid rubber stopper. Contact Us today if you have any questions about stoppers.